← Three Days and Some Hours Left! Today has been the highest pledge day since September 16th! I have to hand it to the Bombardiers, you guys really got out there and beat the bushes to drum up the pledges. I also want to welcome and offer a sincere thanks to all of our new backers who are starting to jump on board as we count down the final hours of the Kickstarter project. Our Next Goal – Less than $4000 to go! 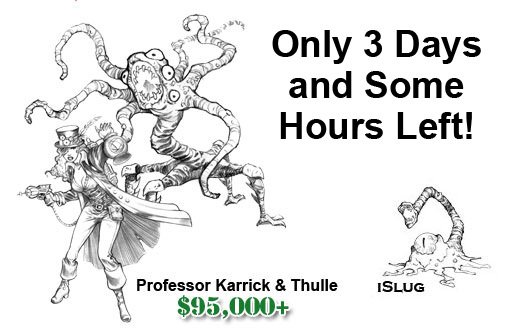 $95,000+ Professor Karrick & Thulle will be available as a Reinforcements Add-On Set for your additional pledge of only $10. Along with that, when the goal is reached, we will add a Sidekick iSlug to every BOMB KIT for FREE! We have restacked the graphics on the main project page. Hopefully the new Rewards Levels image will make pledging a little easier to understand. $200 NEUTRON which includes the BOMB KIT + 15 additional Babes choices (18 Babes total) + Your choice of any 3 unlocked Reinforcements Sets. If you pledge $230 and select NEUTRON you will be able to get one of everything offered, if we unlock all the Babes and Reinforcements shown. That would be 18 total Babes and six Reinforcements Sets. This actually saves $10 from the total of the previous NAPALM Level + 6 Reinforcements which totaled $240. We increased the number of HYDROGEN Levels to include three new sculpts. 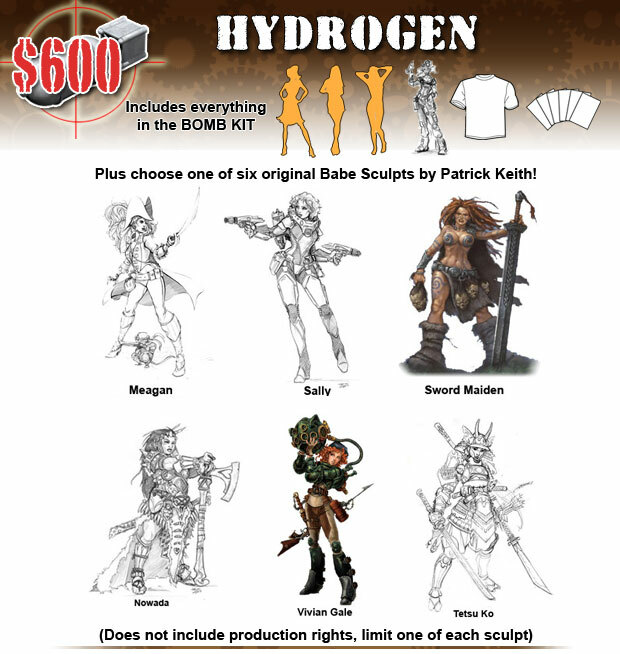 If you pledge at the HYDROGEN Level you can get one of the offered sculpts for Meagan, Sally, Sword Maiden, Nowada, Vivian or Tetsu Ko. If you want to upgrade your HYDROGEN Level with PLASMA to get a sculpt plus 18 Babes plus 3 Reinforcements Sets of your choice, pledge at the $725 amount and select the HYDROGEN sculpt of your choice. After the project closes you can indicate the PLASMA upgrade during the survey. How about that for an awesome Bombshell Blast?!? We have added the fourth Relic – Tallah the Swordmistress to the Additional Support section. You can get as many items as you like from this section for the additional pledge amounts indicated. Most of today has consisted of sculpting and updating the Main Page Graphics™. The itinerary for the next two weeks will be thus. Tomorrow will be more sculpting with hopefully more pics of the Babes in progress. I still have several outstanding pieces to finish for Neomics, Laughing Monk, Reaper, DGS Games and Antimatter as well as a couple of others. Fortunately the Privateer piece goes out in the mail in the morning. Thursday is our weekly visit to the Reaper Factory where I will be meeting with some of the other Bomb Squad participants and dropping off at least a sculpt or two. Friday will be spent monitoring the final hours of the Kick project followed by a celebratory gathering at a local pub for some well deserved suds and darts! Saturday the Sculptdude turns 45! So, I’m taking that day off. Wednesday will be the beginning of Reaper Artist Conference, a week-long conclave of painters and sculptors sharing all the latest tips and tricks we’ve put together from the previous year. I will be taking all the Babes along with me and while working on some additional Reaper things, will also be posting the first of the Regular Friday Updates™ from the con. So, I know many of you are probably thinking, “Whew! All this will be finished up Friday.” And for many it will be. But it is actually the start of Bombshell Miniatures, because all the work to bring you the best Babes we can really begins!